Foot and ankle training is a topic that is relatively neglected and overlooked in the field of kinesiology. However, proper activation and function of these areas is not only vital for maximizing performance and strength but is also critical for tissue health and injury prevention. Other than proper posture and spinal alignment, foot and ankle function may be the single most important factor when it comes to optimizing movement quality, biomechanics, and muscle function. If we’re talking about building strength from the ground up the first place to start is with the feet, ankles, and toes. For most movement, neural signaling begins at the feet. The better the feet and ankles are functioning the better the innervation all they way up the kinetic chain including signaling to the upper extremities. When the feet and ankles are in a state of dysfunction any movement that requires even a slight degree of foot and ankle support becomes impossible to perform properly. The movement may look right on all accounts but intramuscular and intermuscular coordination as well as overall motor unit recruitment are greatly compromised. This is something I refer to as “pseudo arthrokinematic manipulation”. It may look right to the eyes but neuromuscularly it is wrong. Unfortunately a majority of athletes, lifters, and general populations display foot and ankle dysfunction to varying degrees with most of them exhibiting externally rotated feet, valgus ankle collapse, and toe crowding (lack of space between the toes). A majority of high-level athletes have incredibly poor functioning feet and ankles. Many of them have feet and toes that resemble those of disabled and physically impaired/crippled individuals. No matter how strong, powerful, mobile, agile, fast, or explosive an athlete is, correcting these foot and ankle deficiencies will only improve upon their pre-existing biomotor capabilities. Addressing foot and ankle deficiencies will do wonders not only for strength and power but will also do more for technique and movement mechanics than most forms of corrective exercise. In fact, performing heavy lifts, particularly for lower body without proper foot and ankle mechanics only reinforces movement dysfunction. Many injuries, tweaks, and areas of general tightness particularly in the lower body and lower torso are related to faulty ankle and foot mechanics. If you consistently have tightness or pain in your hips, knees, or low back then your feet and ankles need addressing. In fact it becomes impossible to squat or perform any other lower body movement correctly with faulty foot and ankle mechanics because hip and foot activation are directly related (one greatly impacting the other). With that said training the feet and ankles properly will have an immediate impact on hip function, mobility, muscle function, and lifting technique. Core strength and postural mechanics are closely related to ankle and foot activation. Getting better at one will almost always improve the other. Furthermore addressing both postural positioning and foot mechanics will resolve a majority of movement dysfunction as well as improve function in muscles throughout the body. In addition, just because you play sports or perform consistent activity on your feet does not mean you have strong ankles or feet. In fact it probably places you at higher risk for faulty foot mechanics. On a similar note, most shin splints, ankle injuries, and foot pain, are related to weakness and dysfunction in the aforementioned muscles. Rarely is it an overuse issue but rather an issue of faulty or incorrect use. Training the feet and ankles appropriately will address this. Remember, injuries such as shin splints are tell-tell signs that movement mechanics and function in the distal portion of the lower extremity are amiss. The good news is all of this can be remedied with proper training of the feet and ankles. If a majority of your physical activity is performed in traditional shoes and you do little to train your feet and ankles then you most likely possess faulty ankle and foot mechanics. Most shoes act like a crutch helping absorb force and impact that should ideally be performed by your foot and ankle muscles. Overtime this allows the muscles of the feet to become neuromuscularly inefficient gradually leading to improper foot and ankle mechanics being engrained into the CNS. Performing activity in Pedestal Footwear Products (once the athlete has prepared and trained their lower extremities properly) builds strength, proper firing patterns, and optimal foot mechanics. Competitive athletes involved in activities including but not limited to strength training, football, baseball, basketball, tennis, soccer, and track, should spend a significant portion of their training, practice, and skill work barefoot or in Pedestals. This helps to build foot and ankle strength as opposed to traditional shoes that typically lead to foot and ankle deficiencies. With barefoot training don’t go too extreme too soon or you’ll set yourself up for injuries. Gradually progress into it. For some, fixing your feet and ankles will take weeks, while for others it may take months if not longer. Eventually you should be able to perform all of your physical activity in Pedestal Footwear Products. Many athletes display very passive foot activation when making ground contact with their feet. This often appears as though the foot is very dormant and inactive with little innervation running through the foot and ankle complex as well as the toes. Rather than having the feet sit on the floor like two limp pancakes, the goal should be to incorporate active foot mechanics. 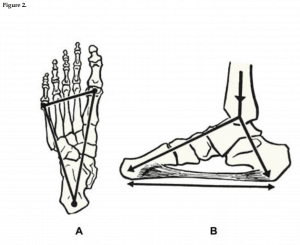 Active foot mechanic should be incorporated on a majority of physical activities and movements. This involves gripping the floor aggressively with the feet, having more stress towards the outside of the foot, toes activated (especially the big toe), and the whole foot feeling as though it’s gripping or screwing into the floor rather than passively resting on the floor. In order to gain strength from the ground up it’s important to incorporate specific movements and exercises that strengthen the feet and ankles as well as eliminate deficiencies specific to your area of dysfunction. Although you can perform general strengthening exercises for the feet and ankles it’s best to determine the specific type of dysfunction before charging ahead. This will allow you to perform the ideal exercises and training routine that are ideal for your specific issues. Although there are numerous types of foot and ankle deficiencies most issues fall into one of two categories, either pronation/eversion or supination/inversion. A majority of individuals display ankle pronation/eversion. This is often accompanied by protrusion of the inside ankle bone, a valgus foot collapse/ankle valgus (inward collapse of the foot), flat feet, fallen arches, overlapping toes, bunions, and hallux valgus (inward collapse of the big toe). Significant foot rotation in either direction (excessive lateral or external rotation of the feet (duck foot syndrome), or internal rotation (pigeon toe position) are also commonly associated with the above issues. These tendencies can lead to a host of other related problem such as ACL tears, low back injuries, knee pain, osteoarthritis of the lower body joints, severe ankle injuries, and various pulls, tears, strains, sprains, and fractures in the lower extremity. If you trouble driving your knees out on squats, or if your feet have a tendency to significantly flare (out or in) on a consistent basis then the above syndrome probably describes your foot mechanics. On the opposite end of the spectrum yet less common lies the supinated foot, a syndrome more commonly seen in individuals that are bow-legged. These individuals tend to place greater stress on the outer or lateral portion of the foot. If you had to choose between pronated or supinated ankles, supination is definitely the lesser of the two evils although it still has its share of issues. Foot or ankle supination tends to be associated with inflammation throughout the outer ankles, shins, and hips including the IT band. Although the problems are typically less severe than those seen in ankle pronators, these individuals can be susceptible to ankle sprains and chronic foot discomfort. 2. The lateral upper portion of the foot or outer ball of the foot in line with the 5th metatarsal, baby toe area. 3. Near the proximal phalange also known as proximal phalanx, hallux or more commonly the big toe. In addition it’s important to have optimal yet natural toe spread/splay (of all the toes) especially the big toe/hallux in line with the first metatarsal joint. In other words the big toe should be spread away from the other toes, not towards them. 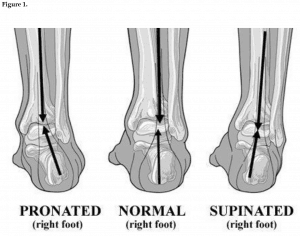 Determining which category you fall into is actually quite simple (supination or pronation). First, many individuals already know which category they land in as they’ve previously been assessed by a physician, trainer, or therapist, or they’ve simply taken the time to analyze their own feet and ankles in the past. If you have not been assessed by a professional and hope to perform your own assessment, there are several quick tests you can perform. First, simply stand in front of a full-length mirror and examine your foot and ankle complex. Use the above descriptions and images to determine whether you pronate or supinate. For most individuals this should be fairly obvious. If your feet and ankles cave in then you’re a pronator and if they push out excessively then you’re a supinator. If there’s no significant issue one way or another consider yourself blessed however you most likely still need to strengthen your feet and ankles with general activation exercises. You can also try performing several bodyweight squats as this typically has a tendency to magnify and expose the issues even further. Another effective method for assessing your foot and ankle function is to have a ground height photo taken from the back of your feet and ankles. You’ll be able to see immediately whether you fall into the pronation or supination category by simply comparing it to figure 1. -Choose the foot and ankle routine that’s best for your type of dysfunction based on the below classification and criteria. -Perform 3x per week on off days or as a dynamic warm-up before training heavy. The movements can also be interspersed between heavy sets as a form of active recovery. -Perform 1 round of each exercise listed (as a large circuit), and then repeat once more for a total of 2 rounds per drill. -Take 30 seconds of rest between movements. -Focus on maintaining proper alignment from head to toe on all exercises. On all single leg stands the front leg (non-support leg) should be directly in front of the support leg with no space or gap between the legs/feet when looking on from the front. This represents optimal hip and foot alignment. 5. Single Leg RDL on Soft Surface with No Weight.